This is one of the strangest books I have come across so far reading and reviewing expat-written accounts on work and live ‘in development’ in the broadest sense. Unfortunately, by ‘strange' I don’t mean ‘strangely entertaining’, I mean ‘not good’. “contractors” usually means builders out here in Britain. I genuinely thought Blackwater was a firm of painter-decorators. That’s rotten. You go out there to rebuild some schools and someone does that (being dragged to the streets of Fallujah) to you. Maybe they painted over the light switches. Remind me never to get Blackwater to decorate my house (p.37). As difficult and almost physical pain-inducing as typing this quote already is, it is necessary to get at least a vague idea of the world of words of celebrity-turned-Sunday-Times-journalist Jane Bussmann. A new semester just started and by-way of welcoming our new students, I am sharing a fresh link list with a lot of food for thought relevant for our ComDev program. Our digital lives with fantastic critiques on the Humans of New York hype, tech firms & teenagers and data-driven humanism. In Academia, a great review essay on ethnography, international courts and 'transitional justice' & reflections on how bibliometrics damage science publishing. 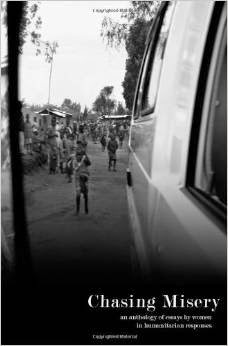 Chasing Misery is a mature, well-written and –edited anthology that represents many of the aspects that make aid work(er) literature important and powerful. Happy New Year! My first link review in 2015-and spending the holidays at home helped to collect a great variety of 2014 reflections, new stuff & the usual potpourri of readings that may be worthwhile to catch up with as the working machine is hopefully slowly getting into gear!